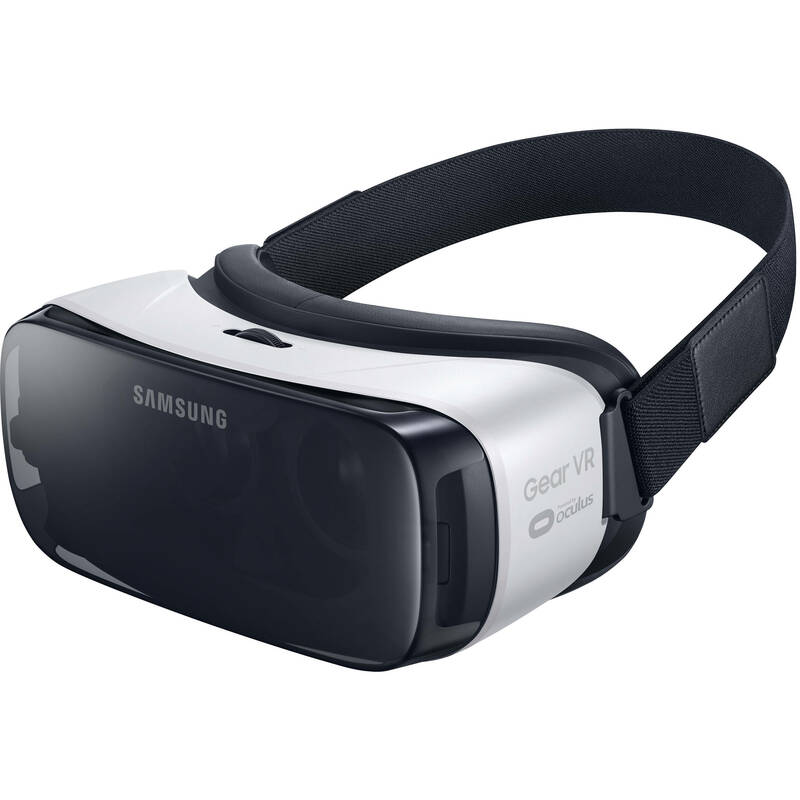 Explore new worlds with the Gear VR 2015 Edition Virtual Reality Headset from Samsung. This headset is compatible with the Galaxy Note 5, S6, S6 edge, S6 edge+, S7, and S7 edge, leveraging each device's Super AMOLED display to provide you with an immersive audiovisual experience with 2D and 3D 360° photos, videos, and games. The 2015 Edition Gear VR is 22% lighter than its predecessor and features new foam cushioning that's designed to make the device more comfortable to wear. Additionally, the VR's touchpad has been revamped to provide enhanced control while enjoying your content. The Gear VR uses Oculus technology, and the Oculus store offers you an expansive library of content for download. Additionally, Samsung's Milk VR service frequently releases new 360° videos. Box Dimensions (LxWxH) 9.1 x 6.5 x 4.0"
Gear VR 2015 Edition Virtual Reality Headset is rated 4.5 out of 5 by 63. Rated 3 out of 5 by Fernando from Not bad for $ The headset will provide many hours of great entertainment. The demo videos and pictures are really good. I use the gear standing up so I can turn and take full advantage of all views. Using the gear with a Note5 is similar to watching an old standard definition tv (while standing too close to the screen). There is definitely a very noticeable screen door effect and pixels are visible. For the first time, I wish the Note5 had a 4K display. I used the ear buds provided with the phone and they worked fine. Considering the far more expensive alternates to VR gear, Oculus Rift or Sony, I think the Samsung gear is the way to go for now. If you purchase this gear, you'll enjoy it but don't expect perfection. Yes, I would recommend this product to a friend. Rated 5 out of 5 by Anonymous from Amazing! I use this product for a variety of things. first (and the most obvious) will be for gaming. Lots of great titles in the Oculus store, should keep you busy for hours. Second, NETFLIX VR!! I just love the feeling of hanging in a beautiful Colorado mountain cabin while still in Brooklyn (of course you'll have a big TV in front of you playing your favorite Netflix title). Third, The music apps! I can import my spotify playlist and listen to my music in a super trippy, Tron like VR room. Its really great for the immersion and the meditation. If your on the fence about VR I say just go for it, you wont regret it. Rated 5 out of 5 by Sibastian from This is not the VR headset you're looking for However This is the VR headset for people on the go who have a Galaxy S7 and want to experience VR for themselves and are not concerned with the fact it cannot connect to a PC. Or for people with a tighter budget who can spare $100 and already have the S7 who are not looking for a cheaper Oculus Rift. Overall, I'm satisfied with my purchase. I wish I had done more research and realized it is not the Oculus equivalent, but there's no sense in crying over spilled milk. It does what it does very, very well and I highly recommend it for people who know what it is they are purchasing. Rated 4 out of 5 by CMFH1974 from VR is finally here! This Gear VR is so cool. Oculus has a lot to offer, too. I've been amongst the lions in Africa, soared through the sky on my dragon, shot down alien invaders with my eyes, been live on location during a news broadcast, been on a surfboard as the 25 foot wave curled, met new friends in VR chatrooms, binged on Netflix, surfed the Web, & updated my Facebook status with my Gear VR! Visual quality is decent, but the experience is so awesome....I'll spend the $ for the Rift or other higher end models. Rated 4 out of 5 by Anonymous from Not Perfect But Still Very, Very Cool !!!! I'm rating 4 out of 5 stars because there's room for improvement. That being said, for the money this is a great piece of fun gear !!! The experience of VR is mind blowing. I haven't even used it yet for gaming but the 3D content and 2D movies are a blast !!! Rated 4 out of 5 by Daniel from Comfortable & Immersive I've been waiting to pick up this headset for my Galaxy Note 5. It works wonders. The first 30 minutes ended up being 3 hours. My only complaint is that it seems there are bluetooth issues when having the phone connected to the headset. My bluetooth headphones disconnects frequently when using the headset. Rated 4 out of 5 by Steve from Good initial experience with VR At first I was amazed that VR could seemingly take you to anther dimension. It really is incredible and I can only see great improvements for the future. You do feel like you are a part of the experience for the most part. The user interface could be much better. Often times the descriptions of the videos are not detailed enough and you have to view it to see what's in it. My main objection is the screen door effect on the visuals and the resolution needs to be much higher in most cases. The controls on the VR are a little awkward and take some getting use to. The phone will heat up prompting a message saying to let it cool down before continuing. I found that a small fan directed in front of me helps that problem quite a bit. I'm using a new Samsung Edge . If you have this phone and love tech I think you'll enjoy the headset. Like I said I'm sure in the near future these weak points will be rectified. There is incredible potential here. I believe one day everyone will be using VR like we use computers today. Rated 4 out of 5 by Anonymous from As close to the hollow deck as you can get I received this head set as a gift. After a quick setup with my Note5 I was blown away I can not say enough good things about the experience you will get. There are lots of free apps to get you immersed in a virtual world of science fiction horror thrill rides and video every single person that tried them were blown away first words out of there mouth is WOW. Pros: Easy to setup use and get addicted too made well not much can go wrong you can charge your device while connected, I wear glasses but didn't need them because they can be focused Cons: Takes a bit of effort to a just it to be comfortable for prolonged use. Best to sit in a chair that can rotate 360 degrees and head phones is a must. If you have a compatible device and are a techie type then there is no excuse to getting this. The Gear 2015 is only compatible with the Galaxy Note 5, S6, S6 edge, S6 edge+, S7, and S7 edge. does it work with the mega? This is only compatible with the listed phones. The Mega is not supported. The manufacturer says this device is available November 21st. Will this device be available on that date? Your site says December 7th for some reason. Thats absurd. Best Buy is shipping them out today. 2 full weeks before youre saying there available. Ridiculous. I stay in thailand you delivery ? Can it work with the Samsung Galaxy grand prime? I'm sorry. The Gear VR is only compatible with the Galaxy S7, Galaxy S7 edge, Galaxy Note5, S6 edge+, S6, S6 edge. Do you guys have this in Stock ? The item's availability is listed on the product page. If the item is not in stock, it would be noted this item is currently unavailable and would offer the option to send an email notification for when the item becomes available. Will this work with my iphone 6s? The Samsung Gear VR 2015 Edition Virtual Reality Headset was designed only for certain Samsung phones. It is not compatible with any iPhones. What is the difference between this model and the previous model Samsung Gear VR Headset? Aside from cosmetic changes, Samsung added some new buttons, including a Volume control. The field of view is a bit wider.